I am writing this post to teach you how can you install fonts with your setups.Here i”ll teach you to write a font installer script so that you can use it to run with other setups. 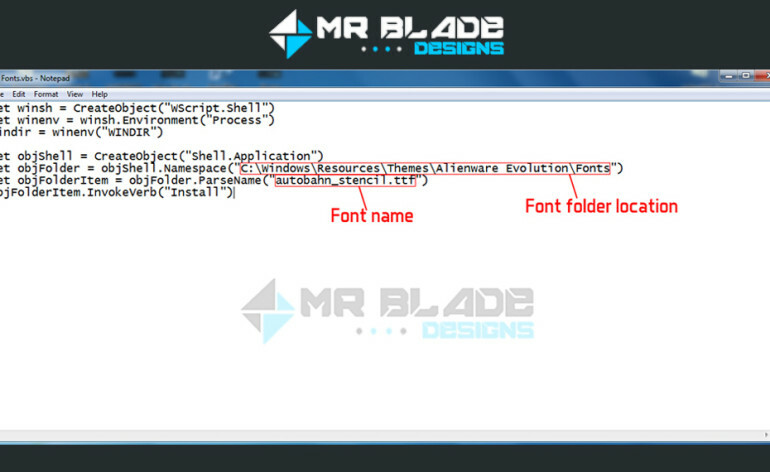 Now have a look at the code above,in 5th line where I have placed C:\Windows\Resources\Themes\Alienware Evolution\Fonts you have to type the font folder path.Like for example my Font file was located in C:\Windows\Resources\Themes\Alienware Evolution\Fonts but you can type any other location like C:\ or C:\Windows etc. Now the 6th line contains the name of the font file.You can see I will be installing autobahn_stencil.ttf using this script.You can type any font name instead but make sure the font is located in the folder which you have typed in line 5. Now if you want to install multiple fonts then you can simple copy the code and paste again & again, make sure you change the folder and font name. Step 5: How to implement it in a installer? What i do is instead of Winrar SFX i use a software Smart Install Maker.It’s very user friendly software and i have been building my theme’s setups using that software , in the next post i”ll teach you how to make setups with that. Feel free to leave a reply here if you cant understand steps! I’ll try to explain you.